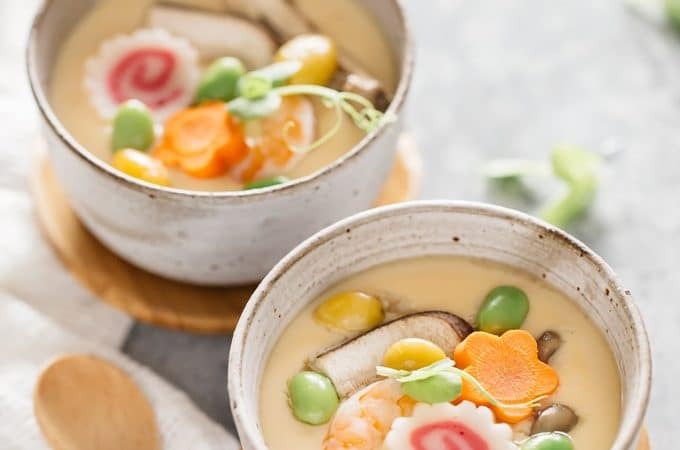 Master the ultimate Japanese dish “Chawanmushi” today. Silky smooth savoury soft egg custard subtly and delicately flavoured, yet packed with Umami. Furthermore, this sophisticated dish can be cooked in 30 minutes. 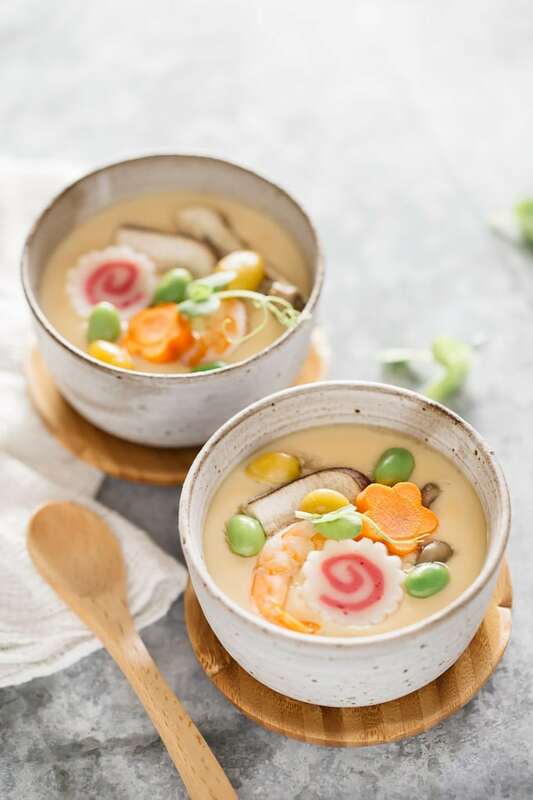 Chawan(tea cup) mushi(steam) literally means teacup steamed egg custard. Unlike other egg custard, Chawanmushi is not sweet but it has savoury flavour packed with umami from dashi stock and topping ingredients. What the Egg mixture is flavoured with? The Egg mixture making Chawanmushi only requires 4 ingredients – eggs, dashi stock, soy sauce(usukuchi), and mirin. If you like softer texture Chawanmushi, the perfect ratio of eggs to Dashi stock is 1 to 3. For example if your egg weigh 50g, you need 150ml of dashi stock. If you like harder texture Chwanmushi, change the ratio to 1 to 2.5. 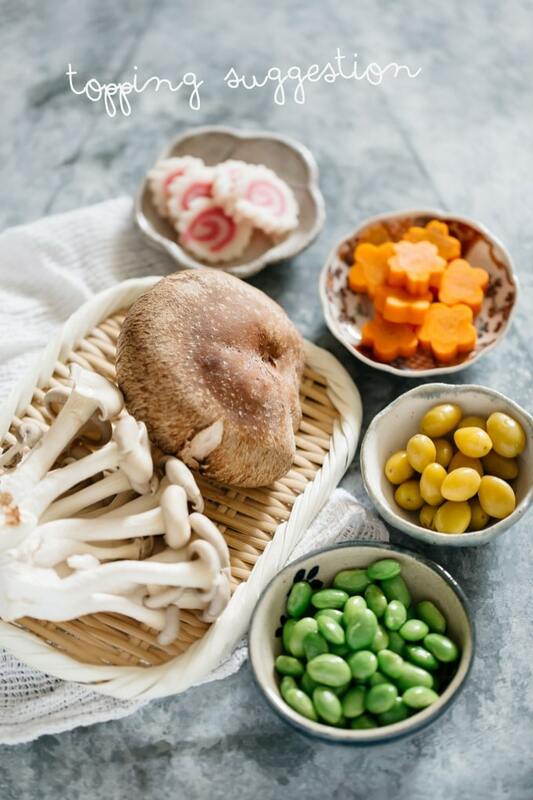 It is typically topped with fish cakes either (Naruto or Kamaboko), Shiitake mushrooms, Ginnan (Ginkgo nuts), and shrimps or chicken meat. Also wilted spinach or parboiled broccoli and decoratively cut carrots will add striking colour. Ginnan is Ginkgo nuts in English. It is seeds of Ginkgo tree and it has whitish coloured shell and yellow flesh. It has a delicious nutty flavour and often used as an ingredient in Japanese dishes such as Takikomi Gohan and Chawanmushi. Luckily I found it in dried form in a packet at a local Japanese grocery store. 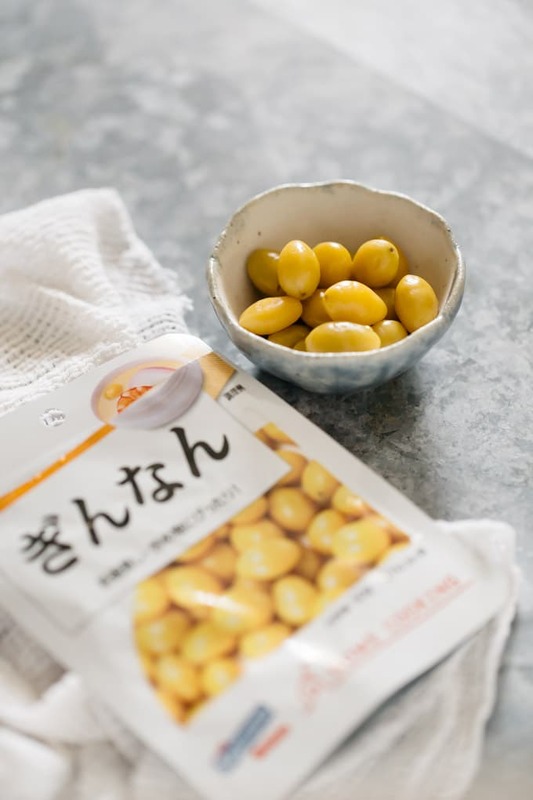 You can purchase dried gingko nut online too. 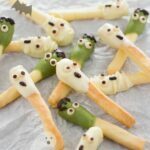 What is Naruto and Kamaboko? Both Naruto and Kamoaboko are fish cake but in different shapes. Naruto has a pink spiral pattern which resembles the Naruto whirloops in the Naruto Strait. 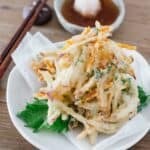 You have probably seen this fish cake in any Ramen dish as it is often used for a ramen topping. 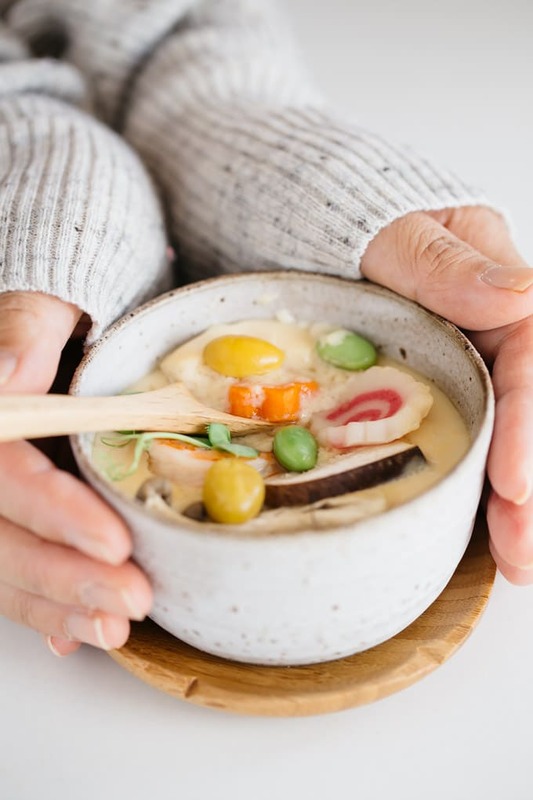 In Japan, Chawanmushi is very popular and often cooked at home in a special dish. It is teapot shaped and special Japanese pottery. They are commonly and readily available to purchase. They come with a little individual lid too. 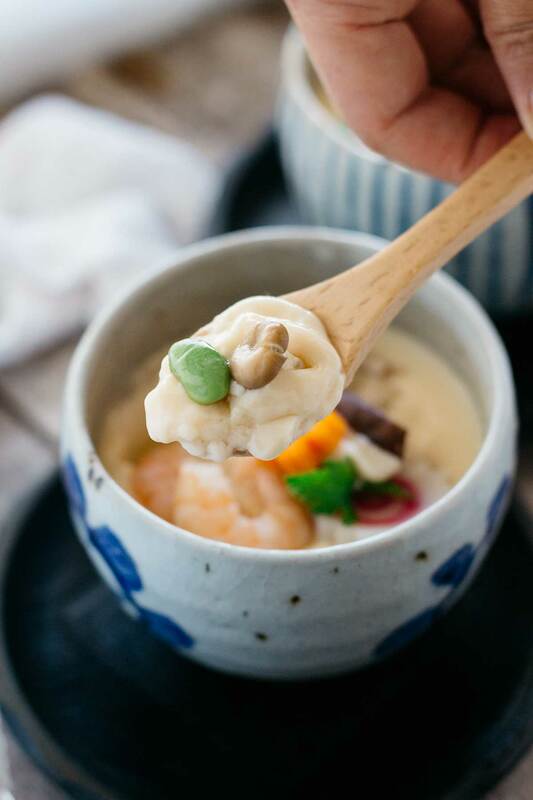 Although Chawanmushi is a fairly simple dish, the common failure in making it gives a porous and spongy texture. 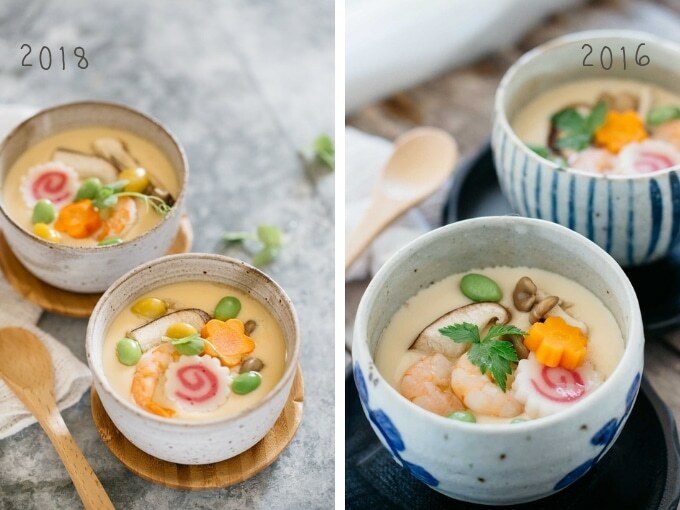 Follow the tips below to make perfect silky smooth Chawanmushi! 1. Try not to aerate the eggs too much. Because if you aerate the eggs too much it will make the Chawanmushi porous. So when you add Dashi stock to eggs, try not to over mix. 2. Drain the egg and dashi stock mixture with a sieve. This one extra step makes it super silky. Most importantly, if the steam is too strong this will make a porous and spongy egg custard. Keep a temperature of 70-80°C (158-176°F) which will coagulate the egg inside the steamer. Here are my instructions for Chawanmushi. So if you like it, please rate it and leave a comment or any questions below. And don’t forget to check out my other Japanese classic recipes such as Saba misoni (makarel simmered in miso) Simmered Pumpkins. 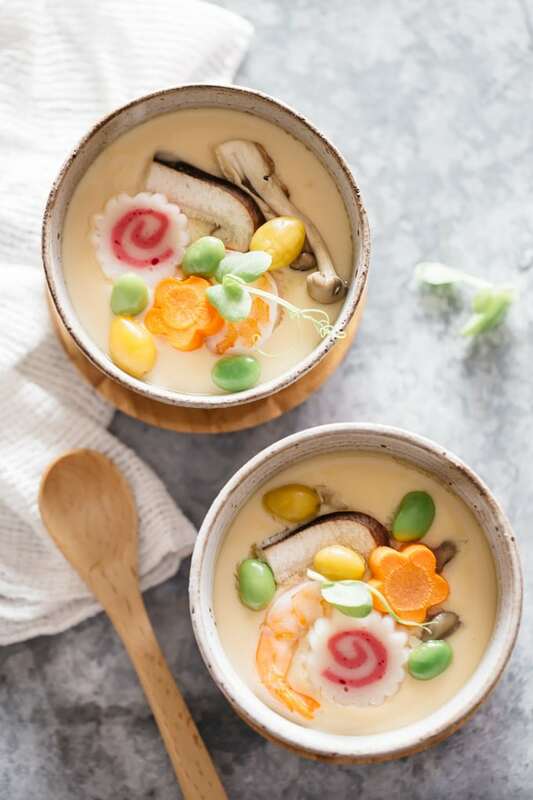 Chawanmushi, the silky smooth savoury egg custard, delicately flavoured Japanese classic and sophisticated dish recipe with step by step photos and a video. 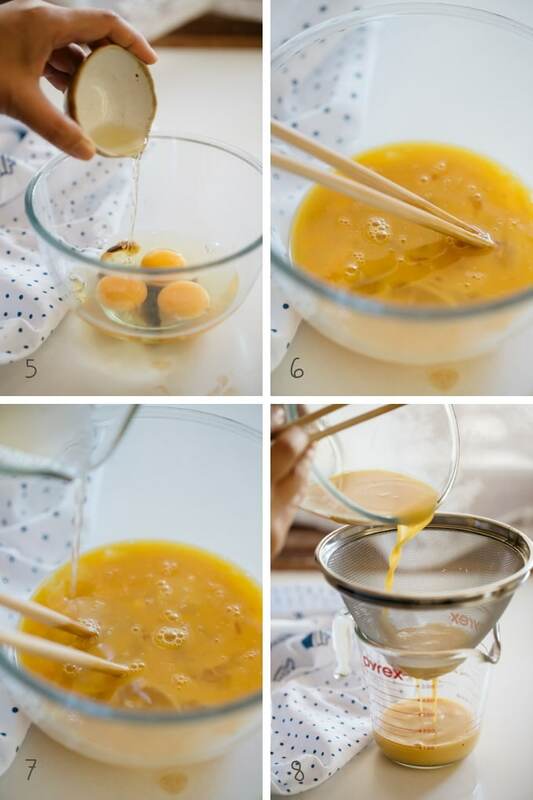 in a large bowl eggs, soy sauce and mirin together with chopsticks and try not to whisk too much to avoid aerating egg. 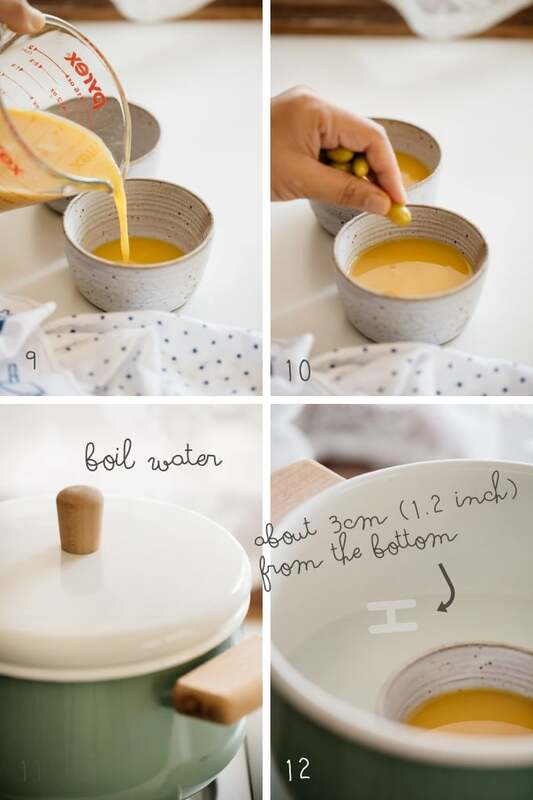 Pour Dashi stock into the ball small amount at a time and mix with egg gradually. Use a strainer, strain the egg mixture in order to achieve silky soft texture when it is steamed. pour water about 3 cm (1.2 inch) high in a pot 20cm ( 7.9 inch) in diameter and bring it to boil over high heat. Once the water boiled, place tea cups in the pot and turn down to low heat. Put lid on and steam about 5-7 minutes. 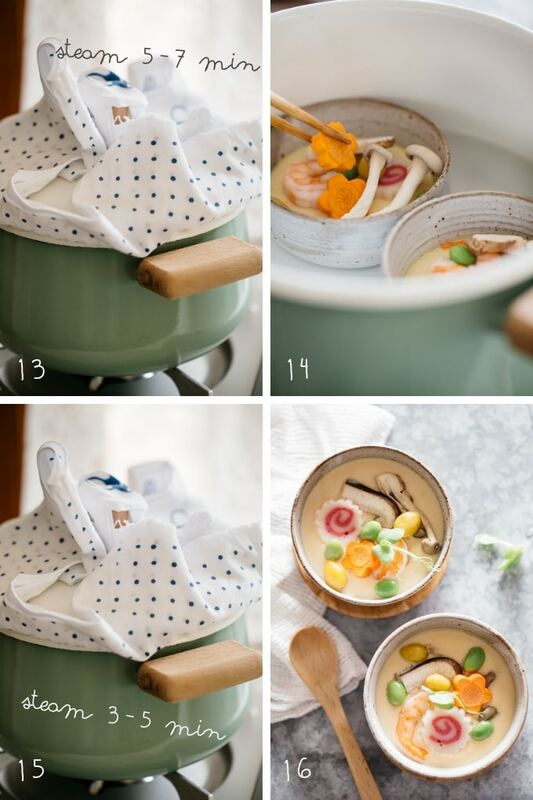 Turn the heat off leave the chawanmushi bowl in the pot for set farther 5 min. *1 Usukuchi soy sauce is a types of soy sauce. lighter in colour but the salt content is higher than normal soy sauce. 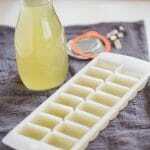 *2 Dashi stock recipe if you are making from scratch or 1/4 tsp of dashi stock powder dissolved in the water. 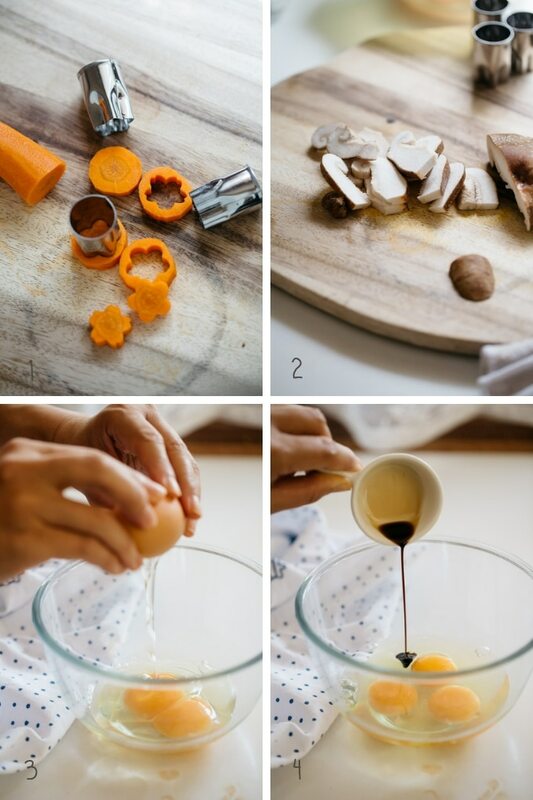 *3 parboil the sliced carrot to make carrot soften and cut out with cookie cutters. I bought those Japanese flower shaped one from Diso. you can get Cookie Cutter here. *4 or cover the tea cups with aluminum foil to avoid the steam water dropped in. *5 If you can find Mitsuba will add another delicate flavour to Chawanmushi but if you can not this is optional. *6 All toppings are suggestions only. If you are allergic to shellfish, shrimp can be replaced with chicken meat. If you can not get Ginnan, just use edamame or something else. All together the toppings should be less than 1/5th of egg mixture amount. This is literally my favorite recipe. I make it at least once a week! Hi Shihoko, I love chawanmushi and I think yours looks very pretty. What is the orange and the green (bean?) thing on top of the custard? Wow! This dish is beautifully put together! 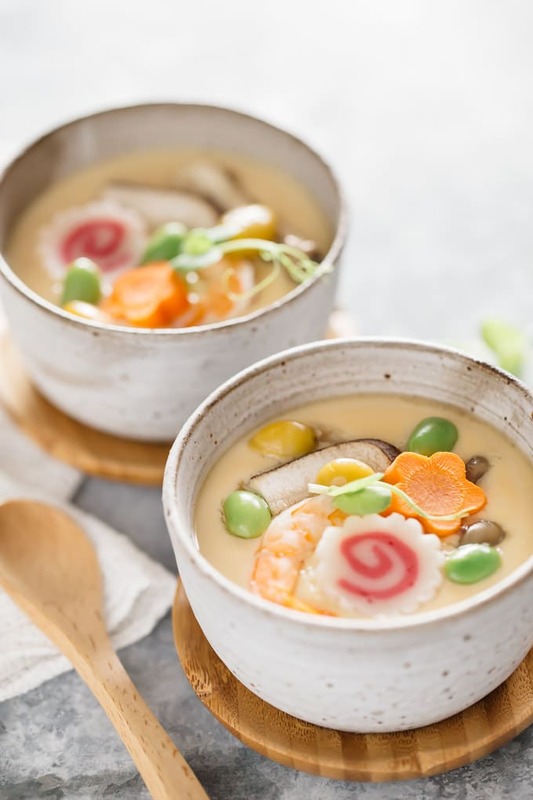 I myself have never tried chawanmushi, your presentation makes me ready to dive in! I need to try this out! Looks flavorful and delicious! Thank you!! Yes, this is very tasty and flavorful dish. Can you get ready make dashi? Yes, Teresa. It Look like this. You can buy them from any Asian or Japanese grocery stores. Thank you so much for sharing your recipe and all the beautiful photos and the helpful video. I had chawanmushi at a family’s house in Japan and it was my absolute favorite dish from my whole trip. They don’t offer chanwanmushi at Japanese restaurants where I live (in Washington DC) so I was super excited to find your easy-to-follow recipe. I’m very lucky that I live close to a small Japanese store so I can get most of the ingredients you listed, but they don’t have real mirin there. They have bottles that say “mirin” on them, but they aren’t wine – just a sweet liquid. Is that ok, or should I look for real mirin elsewhere? Also, there are lots of ginko trees where I live (and I’ve even seen people collecting the nuts when they fall in November!). Is it complicated to prepare the raw nuts from the trees to use in this recipe? Are the ones you use dried or cooked in some way? Thank you so much for your advice — arigato gozaimasu! I bought the no-alcohol mirin and made your chawanmushi recipe twice now using ramekins. It came out super delicious, but both times it took much much longer to cook than the times you have listed here (more than 45 minutes + 10 minute to set with the heat off). When you say to turn the temperature down to low on the stove top, should the water still be simmering? Or is it just hot and steaming, but not simmering? When I turn my stovetop to low, the water stops simmering and is just steaming. I wonder if maybe that’s why it’s taking so long to cook… Do you have any advice?